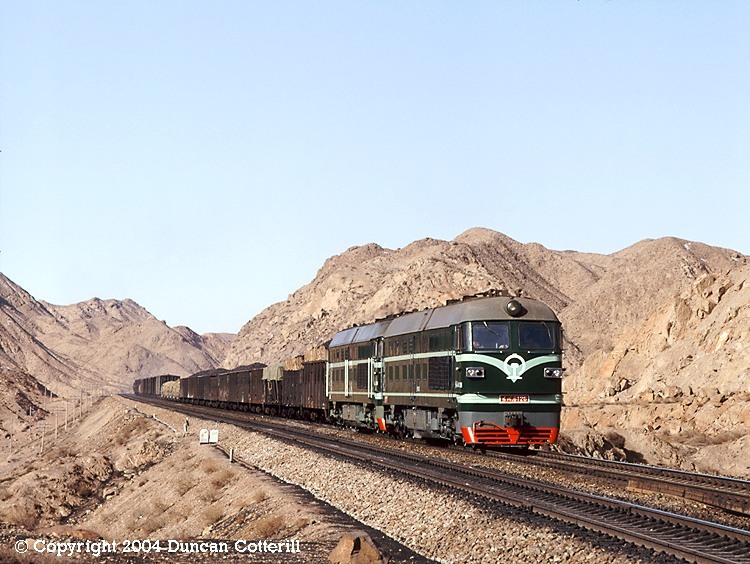 Hexipu is a former division point on the long trunk line running north-west from Lanzhou to Wulumuqi (Urumchi/Urumqi). The town lies at the foot of a long climb through barren country to a summit 500m higher near Jiling, around 40km to the west. Between Pingkouxia and Yushi the line runs through a narrow valley surrounded by rocky hills. In January 1992 the transition from steam to diesel was well advanced and pairs of shiny new DF4s were commonplace on the line west of Hexipu. DF4 6126 and DF4 1836 rolled downhill towards Pinkouxia with an eastbound freight on 14 January 1992.